It was supremely still. 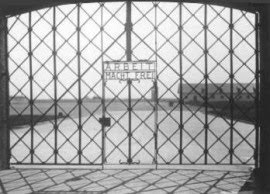 The air of Dachau was not easily breathed as our minds attempted to take in the implications of the place. Conversation was minimal as if we feared disturbing the peace. Silently my husband and I entered Dachau’s memorial archive. Black, six inch letters scattered across a white plain - All that is required for evil to triumph is for good men to do nothing – stopped us cold. What had started out as a quick “point of interest” visit, ended eight hours later when we boarded the bus back to our hotel. High def images and those bold black words will be forever burned in my memory. They are tapped again and again at every injustice, broken vow, murder account, slanderous story, act of violence, gossipy tongue that I hear about, see or experience. Shamefully, too many times I do absolutely nothing. Fear stops me cold. Even after all they had experienced with Jesus, when the going got tough, the disciples fled in fear for themselves. They left Jesus to the results of the slanderous betrayal of one of their own. And, I sometimes wonder if perhaps Judas hadn’t revealed his character previously but no one had had the courage to confront him. It is only a wonder. There are numerous ways evil triumph’s in our world today. It usually starts out miniscule and of seemingly no consequence. But then we’re shocked at the stories and the repercussions of a tiny seed named evil. From murder to gossip to slander to adultery, the list is endless. Evil keeps growing, living, multiplying, existing because good men (women) do nothing. Thought for the day: What evil have you seen or experienced and should speak out against? against all that you consider evil. Help me to find my voice, today!